Justin Many Fingers, the Making Treaty 7 artistic director. On Feb. 26 and Feb. 27 at the Southern Jubilee Auditorium in Calgary, a brand new work from the Making Treaty 7 Cultural Society will get its world premiere. 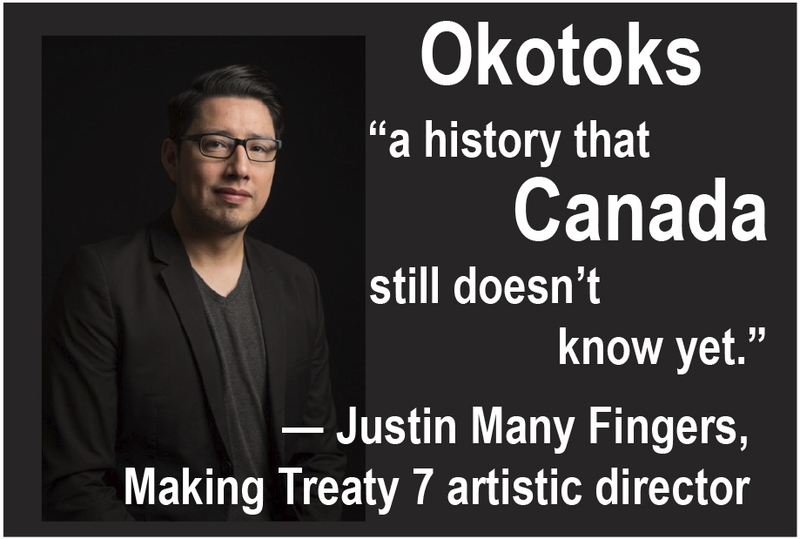 Okotoks has been in the works for four years now, said Justin Many Fingers, the Making Treaty 7 artistic director; at first in collaboration with the now late Narcisse Blood, a founder of the society. And since Blood’s sudden death in a vehicle accident in 2015, community members have stepped in to the void to piece together information about the massacre, which is a part of Treaty 7 history. Making Treaty 7 works to explore the historical significant of the events at Blackfoot Crossing in 1877 where Treaty 7 was signed, while it investigates the consequences and implications of the treaty through a modern lens. The massacre occurred in Montana on Jan. 23, 1870 at a Blackfoot camp. About 200 people were killed by the United States Army. Among the survivors of the slaughter was a young girl named Holy Bear Woman, who was 12 at the time of the Baker Massacre. Many Fingers is one of her many descendants. “The story tells about the resilience of one young woman and how much her and how much her bloodline has impacted the culture today,” said Many Fingers. The U.S. cavalry, led by Sgt. Eugene Baker, had waited to strike the camp until the men had left to hunt, leaving mostly women, children and the elderly. When the Blackfoot men came back, they found their people all but wiped out. The presentation also looks at Indigenous men within the culture, and questions the trauma and today’s domestic violence and “the disconnect put into the culture” from all of the massacres from such violent incidents during the so-called Indian Wars, said Many Fingers. A lot of stories are really hard to hear or think about, said Many Fingers. But there is something in them that can be celebrated “because we still exist today.